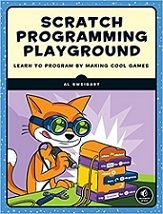 Scratch, the colorful drag-and-drop programming language, is used by millions of first-time learners, and in this book, you’ll learn to program by making cool games. Get ready to destroy asteroids, shoot hoops, and slice and dice fruit! Al Sweigart is a software developer and teaches programming to kids and adults. He has written several Python books for beginners, including Automate the Boring Stuff with Python, Invent Your Own Computer Games with Python, and Making Games with Python and Pygame.